Into the West is a 1992 Irish magical realist film about Irish Travellers written by Jim Sheridan and directed by Mike Newell. Into the West was one of several major films to come from Ireland during the 1990s, including the likes of My Left Foot, The Miracle, The Commitments, The Boxer, The Playboys, In the Name of the Father, War of the Buttons and The Crying Game. The film also received several awards for Best Film, Best European Film, and Outstanding Family Foreign Film. Into the West is a film about two young boys, Tito (Conroy) and Ossie (Fitzgerald), whose father "Papa" Reilly (Byrne) was "King of Irish Travellers" until his wife, Mary, died during the birth of their second son, Ossie. The boys' grandfather (David Kelly) is an old story-telling Traveller, who regales the children with Irish folk-tales and legends. When he is followed by a beautiful white horse called Tír na nÓg (meaning "Land of Eternal Youth" in Irish), from the sea to Dublin, where the boys and their father have now settled down in a grim tower block in Ballymun, the boys are overwhelmed with joy and dreams of becoming cowboys. The horse is stolen from them and they begin their adventure to get their mystical horse back. They escape the poverty of a north Dublin council estate, and ride "Into the West" where they find that Tír na nÓg is not just a horse. The script was written by Jim Sheridan, who did not intend to write simply for children, although the film mainly follows two young children on the run with their beautiful, magical white horse. Other themes targeted to adults, are also present: grief, the clash of cultures with differing values, and the use of the police by the rich and powerful to enforce property rights in their favour. Sheridan wrote the script five years before he directed My Left Foot. Gabriel Byrne said it was one of the best scripts he ever read, and described it at the time as Jim Sheridan's best work to date. Byrne was committed to the work, he said; Apart from it being a story about Travellers, and the relationship between a father and his two sons, it really was in a way about Ireland. Ellen Barkin said that from the first reading she thought it an extraordinary piece of film writing. The movie's most memorable scenes, such as the horse in the cinema and the beans exploding, were shot in the small town of Portarlington in County Laois. The film has received a mostly positive critical reception. On Rotten Tomatoes, the film holds a score of 70% and holds an audience share of 73, and at the Internet Movie Database, it holds a rating of 6.7/10. Roger Ebert of the Chicago Sun-Times said the "kids will probably love this movie, but adults will get a lot more out of it". Variety Staff said that "Into the West is a likable but modest pic", and that "a major asset throughout is Patrick Doyle's rich, Gaelic-flavoured scoring that carries the movie's emotional line and fairy tale atmosphere. Desson Howe of The Washington Post said that the film is "a charming children's crusade – a rewarding journey for all ages". Rita Kempley of the Washington Post said that "the movie is alternately grim and lyrical", and "though long on ambiance and short on story, it may appeal to the spiritually inclined – and to oater lovers. 1993: Roxanne T. Mueller Audience Choice Award for Best Film at the Cleveland International Film Festival – Mike Newell. 1993: Starboy Award at the Oulu International Children's Film Festival – Mike Newell. 1994: Golden Calf for Best European Film at the Netherlands Film Festival – Mike Newell. 1994: Young Artist Award for Outstanding Family Foreign Film at the Young Artist Awards – Mike Newell. 1994: Young Artist Award for Outstanding Youth Actor in a Family Film at the Young Artist Awards – Rúaidhrí Conroy & Ciarán Fitzgerald. 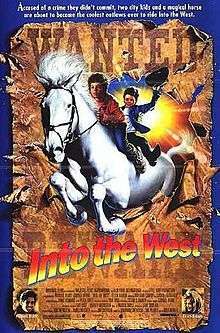 Into the West was released on VHS and DVD format. It was released in the US on 6 November 2001 by Walt Disney Video. The DVD was released in the US on 4 February 2003 by Miramax Films with an aspect ratio of 1.85:1 anamorphic widescreen. The VHS was released in Ireland and the UK on 21 September 1993 by Entertainment in Video. It was released on DVD in Ireland and the UK on 17 December 2001 by Entertainment in Video and again on 15 September 2003 by Cinema Club. ↑ "Awards for into the West". IMDb.com/. Retrieved 28 November 2010. ↑ Brian Koller (25 November 1999) "Into the West (1992) review". epinions.com. Retrieved 28 November 2010. ↑ "Movies/On DVD/Into the West". rottentomatoes.com. Retrieved 28 November 2010. ↑ "User ratings for into the West". IMDb.com. Retrieved 28 November 2010. ↑ Roger Ebert (17 September 1993) "Into the West review". rogerebert.suntimes.com. 17 September 1993. Retrieved 28 November 2010. ↑ Variety Staff (Dec 31, 1991) "Into the West (UK-US)". variety.com. 31 December 1991. Retrieved 28 November 2010. ↑ Desson Howe (17 September 1993) "'Into the West' review by Desson Howe". washingtonpost.com. 17 September 1993. Retrieved 28 November 2010. ↑ Rita Kempley (17 September 1993) "'Into the West Review by Rita Kempley". washingtonpost.com. 17 September 1993. Retrieved 28 November 2010. ↑ "Into the West". clevelandfilm.org. Retrieved 28 November 2010. ↑ "Young Award Award – Outstanding Family Foreign Film". IMDb.com. Retrieved 28 November 2010. ↑ "Young Artist Award – Outstanding Youth Actor in a Family Foreign Film". IMDb.com. Retrieved 28 November 2010. ↑ "Into the West [VHS] (1993)". amazon.com. Retrieved 28 November 2010. ↑ "Into the West (1993)". dvdconcept.com. Retrieved 28 November 2010. ↑ "Into the West – Where Myth and Magic Walk the Earth VHS (1992)". amazon.co.uk. Retrieved 28 November 2010.